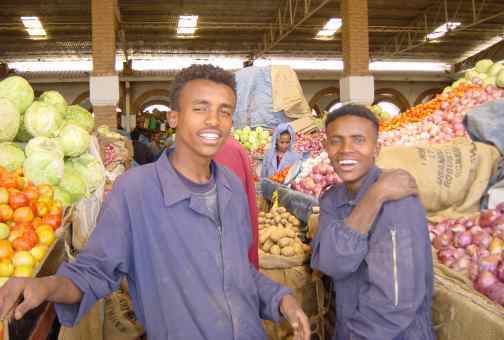 Eritrea is one of the poorest countries in the world, yet was cleaner than many, honest, and easy to visit. We thoroughly enjoyed our 2 weeks there and would visit it again given the opportunity. 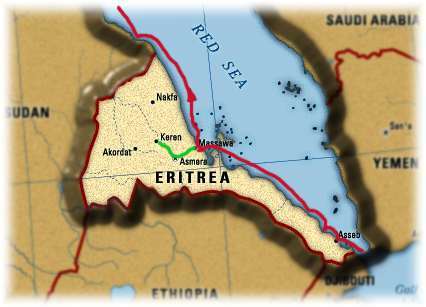 Eritrea - The Country -Eritrea has had a hard life so far, created out of tribal areas by Italy at the end of the 19th Century, it has had to fight for its life with Ethiopia, a much larger but poor land to its South. It also occupies all of the coastline on the Red Sea, thus landlocking Ethiopia. The United Nations tries to maintain the peace between these countries, yet the people were warm and friendly. We anchored one night in this harbor, that had all of the modern equipment needed for a port, but no business or activity that we could see. We called on VHF and monitored all night, but there was no evidence of harbor control or shipping movement. We ducked out early in the morning, glad for the rest, but feeling sort of furtive. No lack of activity here, lots of shipping and yachts kept the main port of Eritrea busy. Yachts were directed to a large basin, well protected from weather and swell, and we enjoyed a week of sheltered rest while we did some land touring. 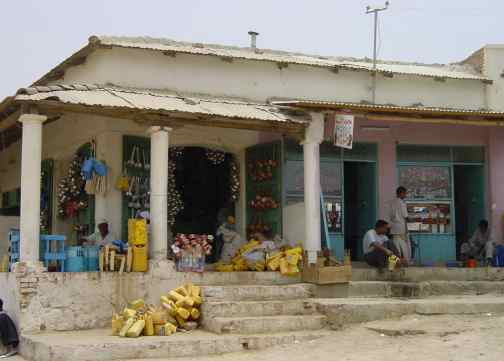 Massawa has seen better days, with bombed buildings and antiquated government offices, but the people were friendly, helpful and honest. We met 'Mike', who was the yachties' friend who organized currency exchange, laundry, tours, fuel, and any other of our needs - good service and we didn't mind if he got a cut of all of the action, he was worth it. The capital of Eritrea was a surprise - a city with sophisticated cafe's, patisseries, wide and clean streets - visible memories from the days that Italy dominated this corner of Africa. Elsewhere in the city was evidence of the border conflict with Ethiopia, UN signs and SUVs everywhere, the blue-helmeted soldiers trying to maintain peace where conflict simmers under the surface. Interspersed with conflict and sophistication was Africa, narrow streets, busy markets, and the everyday life of people who were poor, but proud. Our driver, Solomon, agreed to divert 100 km (for a price) and on surprisingly good roads, we found ourselves in Keren, a small, country town reputed to have a camel market on this day. 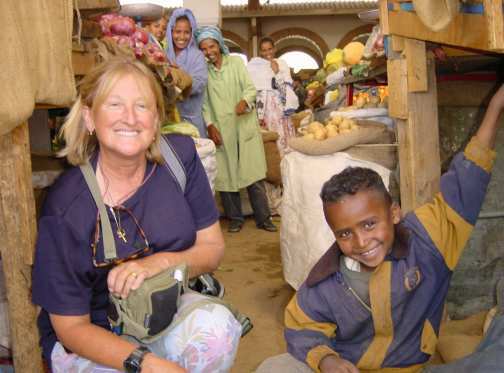 We were greeted by small houses, narrow crowded streets, donkey carts everywhere and no Western faces in sight. When Judi stopped to admire a camel, we ended up negotiating $0.50 for a picture. The camel driver however had other ideas, and cajoled us into mounting and posing - amid much laughter from the crowd that had quickly collected. The camel market included all types of livestock and was fascinating, but we managed to leave without buying one. Many people approached us in the market, some with smiles and others a little more tentative - but all were interested in seeing themselves on the tiny screen of Judi's digital camera. 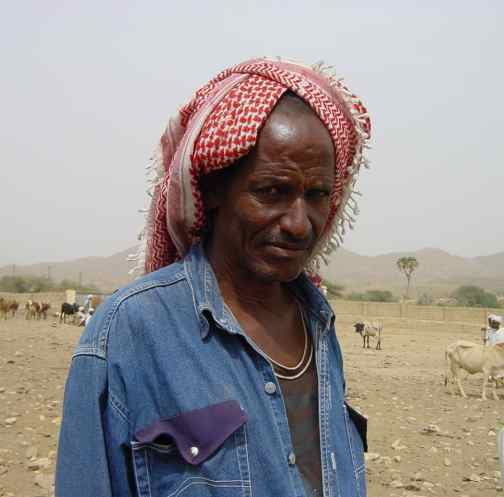 Next country along the coast was Sudan - famous mostly for poverty and conflict, and more recently for the ongoing disaster in Darfur.